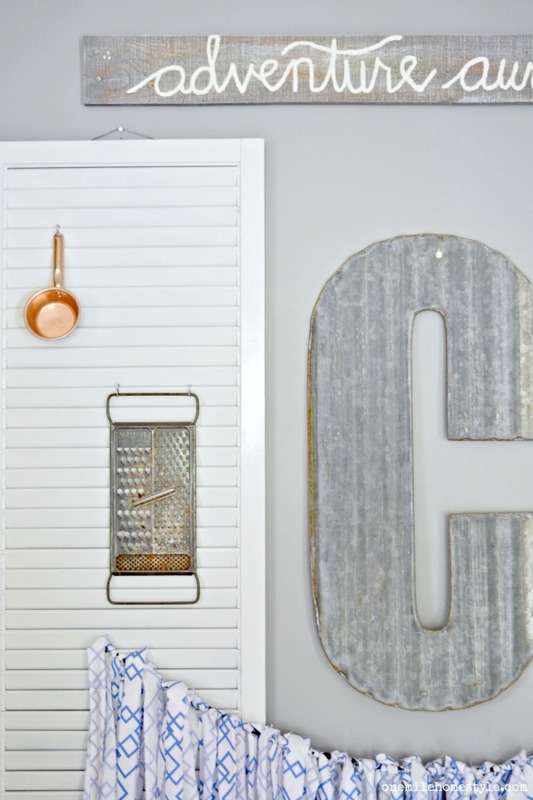 Farmhouse decor is everywhere, and for a good reason. There's just something about it that makes a home feel warm and welcoming, and I think it brings back the feeling of a more simple time. One of the easiest rooms to add a little farmhouse charm to is the kitchen, and I'm going to show you how easy, and inexpensive, it is! 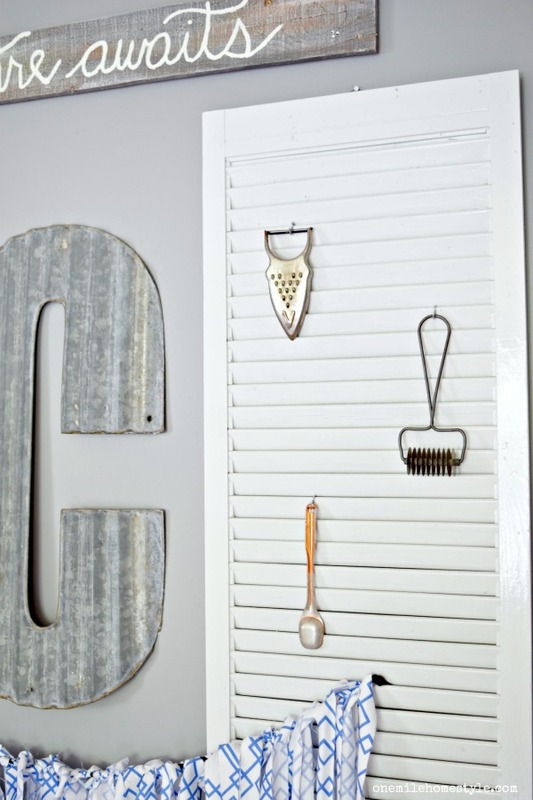 The starting point for this big blank kitchen wall was the shutters I picked up from a Habitat for Humanity ReStore. I gave them a quick coat of white spray paint and hung them on the wall. The metal letter "C" I picked up from a local flea market a couple of years ago. They both add a lot of texture and interest to the space. A quick trip to the thrift store yielded my kitchen gadget treasures. After a few minutes of digging through the bins I found exactly what I was looking for! I plan to go back soon and see if I can find just a couple more to fill out the shutters just a bit more, but this was a great start! 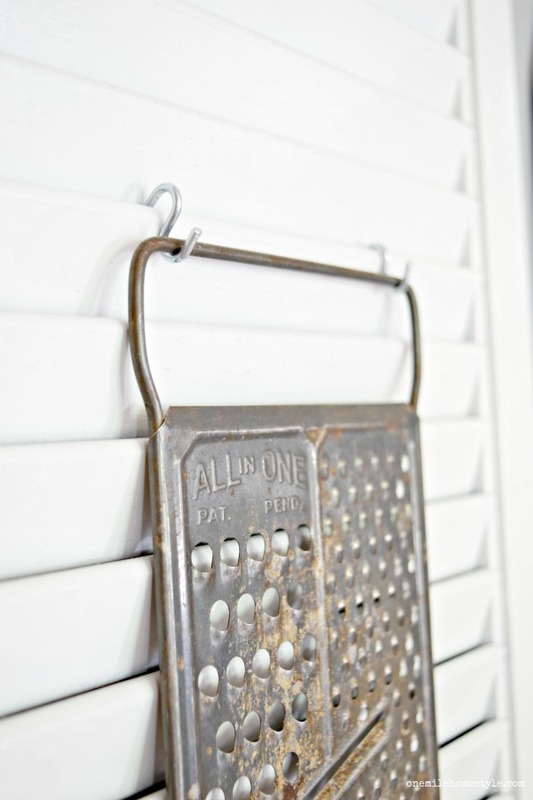 I used a few small "s" hooks to hang my new-found treasures on the shutters. These little hooks make it easy to move everything around until it's just right! Thanks to my little stash of fabric, I made this scrappy bunting with 1-inch strips of fabric that had a coordinating blue and white pattern. And then I topped it all off with a fun "adventure awaits" scrap wood sign. This blank wall is coming together so perfectly, I absolutely love it!! I think I have been tweaking the look of this wall for a couple of years now, and now it's finally looking how I had envisioned it. Decorating takes time; if you really want that collected over the time farmhouse look, it's not going to be a quick process. Take your time, and you will not be disappointed. 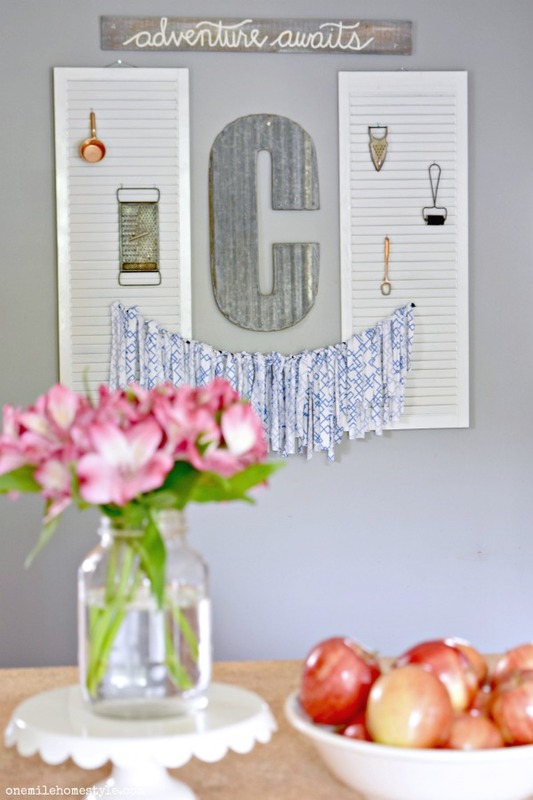 Love the idea of using those shutters! So pretty! Lovely kitchen helps family members to have most peaceful time during dinner or at breakfast. Your banner is darling! I am a garland junkie...off to pin! I love the shutters! 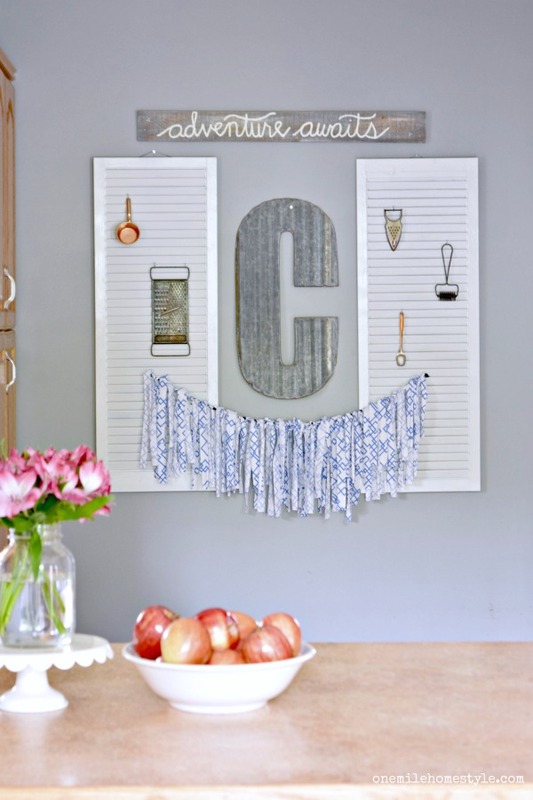 And love how you hang your kitchen essentials off them - so smart!